Make use of team velocity and story maps (group user stories into backbone, walking skeleton and additional elements) to plan the release. A very high-level plan for multiple Sprints (e.g. three to twelve iteration) is created during the Release planning. It is a guideline that reflects expectations about which features will be implemented and when they are completed. It also serves as a base to monitor progress within the project. Releases can be intermediate deliveries done during the project or the final delivery at the end. If the project is feature-driven, the sum of all features within in a release can be divided by the expected velocity. 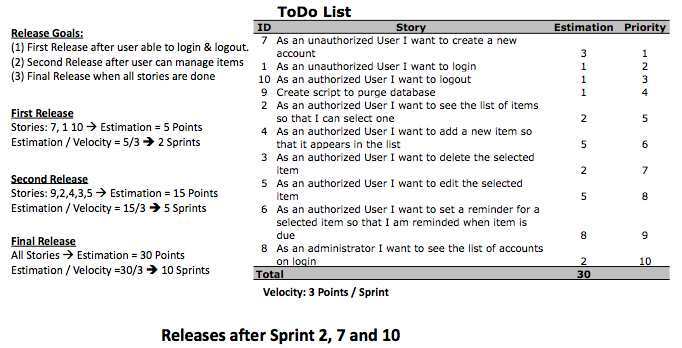 This will then result in the number of sprints needed to complete the requested functionality. If the project is date-driven we can simply multiply the velocity by the number of Sprints and we’ll get the total work that can be completed within the given timeline. Like the Scrum Product Backlog the Release plan is not a static plan. It will change during the whole project when new knowledge is available and e.g. entries in the Scrum Product Backlog are changed and re-estimated. Therefore the Release Plan should be revisited and updated in regular intervals, e.g. after each Sprint.